So Santa brought my 2 ½ year old daughter a set of plush Ty Beanie Baby Chipmunks. All 6 of them, Alvin, Simon, Theodore, Brittany, Jeannette, and Elanore. 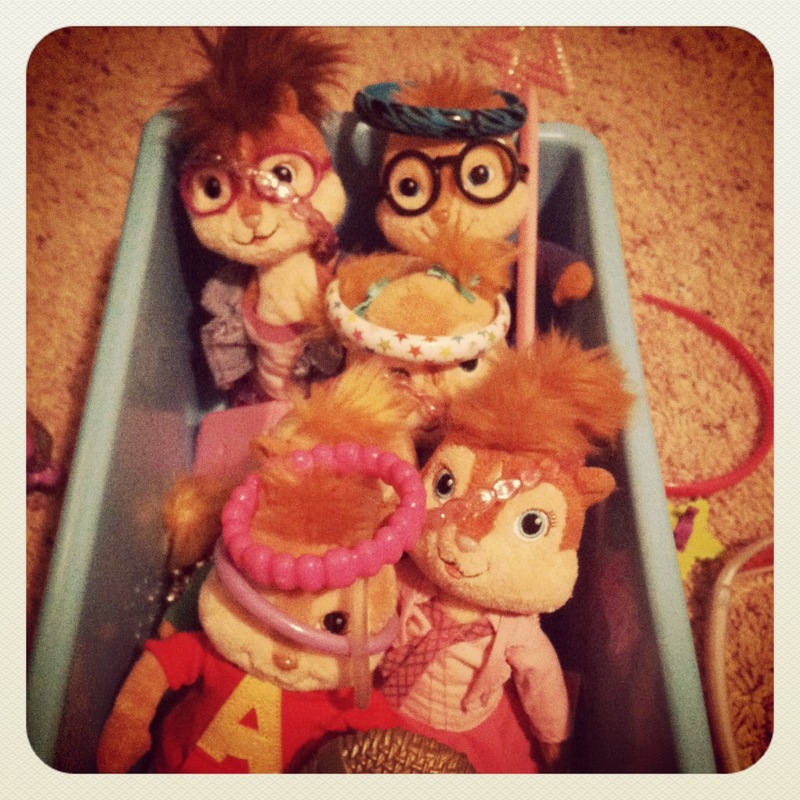 Santa brought her a lot of very expensive toys but it seems like these six little Chipmunks are among her favorites. They are adventurous little chipmunks. For their first adventure my daughter decided they were going to go camping and she put them around a campfire and told us they were roasting marshmallows. Part of our bedtime ritual is for baby girl to do her “Princess Fairy Ballerina” dance. It is important to note that the majority of the time her daddy and I are not the intended audience, but the Chipmunks perched on top of her play kitchen (Also, one of Santa’s gifts) are the audience for whom she does her dance. Recently as I went to check on her in her room I found the Chipmunks had taken to another form of entertainment and were now fully enjoying a game of dress-up. This child surprises me every day. I hope she hangs on to that creative spirit as she grows up. It is so amazingly awesome (Sorry but just amazing or just awesome didn’t seem to work!) to see her grow and learn and be so creative with her play. 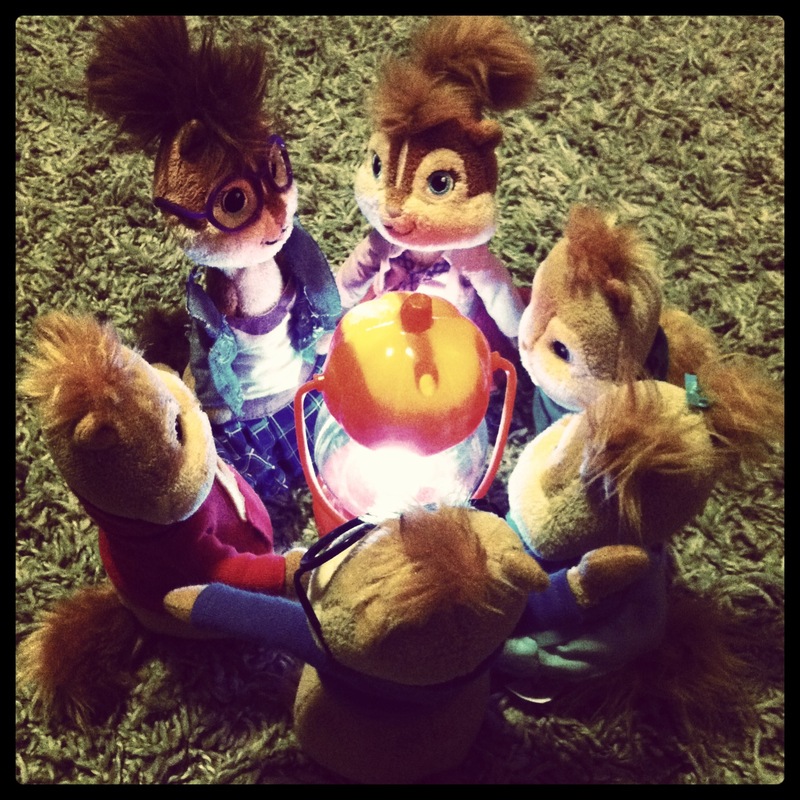 I will continue to update you all with the adventures of the Chipmunks as I am sure there are many more to come! I don’t know if you are aware but Pinterest has added this feature called “Secret” boards. They are boards that only you have access to (or anyone you allow access). So when you PIN something it doesn’t go out to every one of your Pinterest followers or Facebook friends. When they first announced it I thought it was a bit crazy. I mean had no idea why you would really need a secret board. I have found over the last few weeks that I absolutely love this secret board feature. Instead of doing research and printing out a dozen pages or writing down notes and web addresses and such; I can just PIN the details in my Secret folder and then when I need to go back to reference something for my story I just open up the board and the links take me directly to the information I need. • Maps – So I can reference location and make sure everything is accurate. • And a ton of other things. It makes it so easy to click back to one of my PINS and get the information I need to lend credibility to my fiction writing. And that is what it really is about. You may be writing about some off the wall stuff but if you have details in the story that make you credible then your reader will believe you. I truly love the age we are writing in today and the resources that are available to all of us as writers. Who do you share your WIP (Works In Progress) with? For me it is my husband Tony! He gets to be the person I run everything by. He helps me brainstorm ideas and opens my eyes up to things and nuances that I wouldn’t have seen without sharing it with him. I used to share it with my mom too. She was a great sounding board. She was just like me and loved to read. So she understood the nuances and writing details and could really point me out when I was off base and put me high on a pedestal when I wrote something she enjoyed. She truly enjoyed helping me with my writing and it is now that I really miss her the most. I could use her input and guidance. I never finished a story for her. I had all kinds of open ended stories out there and she kept asking for an ending and somewhere along the way I lost my muse and quit writing. She has been gone since September and now sometimes I feel a little guilty that my muse is back too late. But then when I start to feel that way something inside me says that she is up in Heaven pushing me still. And maybe that is why my muse is back. It is going to be different this time around and I am going to finish my story, uh um Novel. I almost have it finished in my mind but it just isn’t all down on paper yet. In the meantime hopefully Tony will not get tired of me filling his ear with ideas and thoughts! So who do you share your WIP’s with? Do you put it out here on the World Wide Web or do you have someone close to you that helps you out. I guess I am paranoid of putting my story out here on the web. Wow, so today I got some good writing in. Baby girl and I went to church this morning. Hubby was feeling sick so he stayed home. When we got back from church it was early and baby girl wasn’t ready for lunch so I gave her a graham cracker and some juice and let her play in her room. I made a cup of coffee and went to my office and while she played I typed, and I typed and I typed. Hubby came in on the occasion to check on me and when I was done having my best writing session I have had in years, I looked up at the clock and it said 4:45pm. Um, I did not feed my child lunch! Are you kidding me! I was so shocked that I had typed right through lunch and well into the afternoon. Baby girl’s room is right beside me and I could hear her playing all the time but she never once said. Oh hey mom, think you want to give me some food anytime soon? I got sucked way too far into my story tonight. I was embarrassed, how could I have completely forgotten to feed my child? There is something about the power of writing. Something about that moment when everything lines up and the words are flying out of your brain faster than your speedy fingers can type them on the screen. That is where I was today for a few hours. It was awesome and horrible at the same time! All’s Fair in Love and Blogging – Or is it Really? I have the absolute funniest story I would like to share but I am not allowed. Yes, you read that right my dear husband, who is bright and funny has declared executive order over the story. I asked him last night are you really censoring me. His answer, a quick yes. I guess he is lucky he didn’t marry a comedian because he would be in real trouble then! You might say that the story I would like to share does not point out his intellectual side. He is very smart, but you would not know that from the story, still it is so funny. He doesn’t want his whole life shared with the world. I told him I only had 9 followers so I didn’t know what the big deal was. Still the story will have to stay locked away for now. Maybe eventually he will see the error of his ways and let me post it. Or maybe next time I have something too funny to share I won’t run it by him first! If it was me and I did something crazy or not so smart, I would feel fine sharing it. But that is me; I can poke fun at myself just as quickly as I can poke fun at others. What about you guys, when you are writing in a public forum like this do you keep the peace with your significant other or would you share the ugly details of a funny story even if they gave you a resounding “No!”. It’s ok; I will have other things to write about. See I wrote about not writing about it today! Well, I have been doing a lot of reading on writing and getting published the last few days and the consensus seems to be that if you are a new writer, or even an experienced one but have not yet made it to the realm of Nicholas Sparks, Nora Roberts or Stephen King, then you need to also be a blogger. Really, I like to blog, but some days I would just like to do work on my writing and not have to turn my mind in a new direction and blog. But if that is what has to be done to work my way towards a publishing deal, then fine. I will blog. But seriously, this new trend for aspiring authors is interesting. It really is about social media. If I have a ton of blog followers then maybe those people will buy my book when it is published. Not necessarily the case but it is what a publisher dreams of happening. Blogging, Facebook, and Twitter are all social media outlets that the up and coming aspiring writer needs to have their hands into. I don’t even think it matters what I blog about and that is good news. Some days I might post about my writing, others I might post about my toddler and as I have done in the past you might get a yummy recipe from me. So here is to working my way towards a publishing deal and for blogging my brains out!